I am thrilled to be reading another book by E.M. Powell. 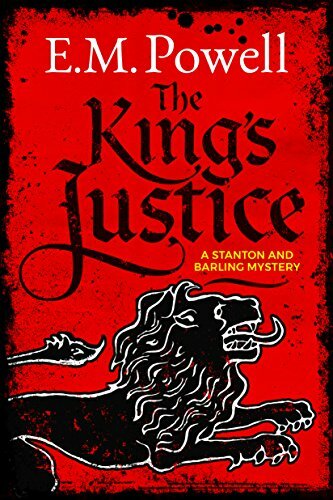 The King’s Justice is the start of a new series featuring a pair of investigators in the time of Henry II. I was sent a copy at no charge for my honest review by Historical Fiction Virtual Book Tours. The King’s Justice is not your usual historical fiction novel. It’s not about a specific historical event or famous person but rather it’s about the institution of the King’s justice. Henry II is known for many of the things he did during his reign – some of them more regrettable than others. I’m talking about oh, locking up his wife and that whole Thomas a Becket debacle. In spite of some of the worst of Henry he was also responsible for creating a system that brought the King’s justice out to his people through circuit courts and this system is the basis for the one we use today. He was a bit of a hothead but he believed in the laws. Part of the problem was the way the laws were applied as the Church was so tightly bound into the justice system. Innocence was not assumed and it’s discovery was incumbent upon passing a trial that basically lead to your death so innocent or guilty the end result was just bad for you. Ms. Powell builds her world around one of the clerks (Barling, a fictional character) to Henry’s justices. A lord from a nearby town comes in to request permission to hang a murderer but the justices want to be sure he is guilty so they send Barling and his assistant (Stanton, a fictional character) to the village to investigate. Stanton is a character from Ms. Powell’s Fifth Knight trilogy, which I did read when it first came out several years ago. I have to be honest – I didn’t remember Hugo Stanton. There were many references back to him and his dead love which proved a touch frustrating because it was not fully explained. Perhaps it will be in the next book or it won’t be referred to as often. Often when books build upon past events the explanations are built into the story lines somehow but in this tale it left nothing but questions. Stanton and Barling are two very distinct personalities and they don’t immediately click. Like any relationship they need to figure each other out and learn what the other can bring to the table. Barling is a very by the book kind of buy and Stanton is more of a man who goes by his gut. So you see where we have a classic pairing for the solving of crimes. Hopefully they will continue on administering the King’s justice. I enjoyed the tale. The characters are intriguing and far from one note. The plot was full of twists and turns and I did not see the ending coming which is always a kick with a murder mystery. I will look forward to further adventures from these two. You can read my reviews of other books by E.M. Powell: The Fifth Knight, The Blood of the Fifth Knight, The Lord of Ireland.